Your sweet son or daughter can “ace” college admission tests by doing the very best they can do, according to their ability. Your child’s score simply needs to be better than most applicants at the college where they apply. Some colleges directly link scholarship awards to a student's ACT or SAT score. You may even see the minimum SAT or ACT score the student needs to receive automatic academic scholarships included on college websites. This financial reward can be worth thousands of dollars per year, which could mean tens of thousands of dollars over the four years of college. 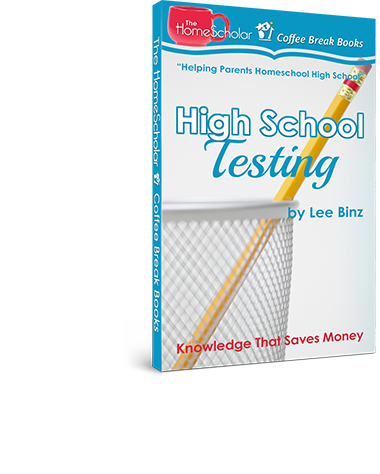 Learn about the other tests too, with this free instant download filled with great tips for busy homeschool parents trying to choose the right test and prepare their students for success: High School Subject Tests Simply Explained. You'll gain critical insights into AP, SAT and CLEP Subject Tests to maximize your college admission and scholarship chances. On the other hand, studying for the SAT or ACT is a total drag! So, let me explain how to get the best possible score on the SAT or ACT without working too hard, studying too much, or becoming too stressed. I suggest that parents have their children start studying for the SAT or ACT during tenth or eleventh grade. Register your child to take the SAT or ACT early in the spring of junior year. Then have them repeat the test again later in junior year, in May or June. 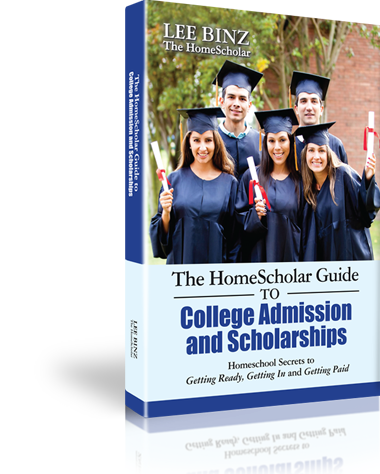 This will give your child the best chance of earning college scholarships. 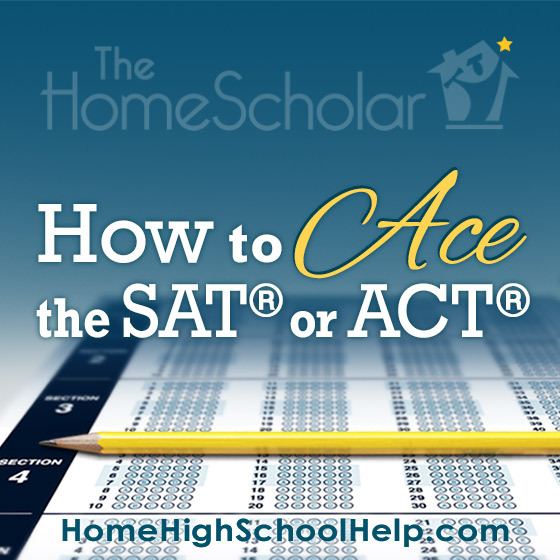 Let me explain how to ace the SAT or ACT. Almost all colleges accept either the SAT or ACT. The SAT measures reading, writing, and math. It includes an optional essay, which is 50 minutes, timed, and handwritten in pencil. 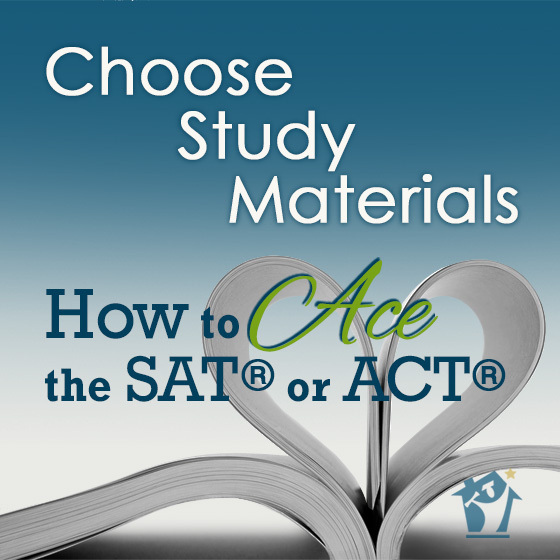 The ACT is similar because it also covers reading, writing, math, and an optional essay. However, the ACT also includes a section on science reasoning. In general, public schools on the coasts tend to offer the SAT, and schools in the center of the country tend to offer the ACT. One third of students typically do better on the SAT, about one third do better on the ACT, and the remaining third do equally well on both tests. Studies claim that boys do better on the SAT and girls do better on the ACT, but statistics are not always right and may not apply to your child. Since science is included on the ACT, science lovers might do better on the ACT, but that’s not always true. What’s most important is to decide which test will be best for your student. Homeschoolers have the advantage on the SAT or ACT, because you get to choose whichever test makes your child look like a genius. So, begin by giving your child a complete sample test, timed and in the comfort of your home. 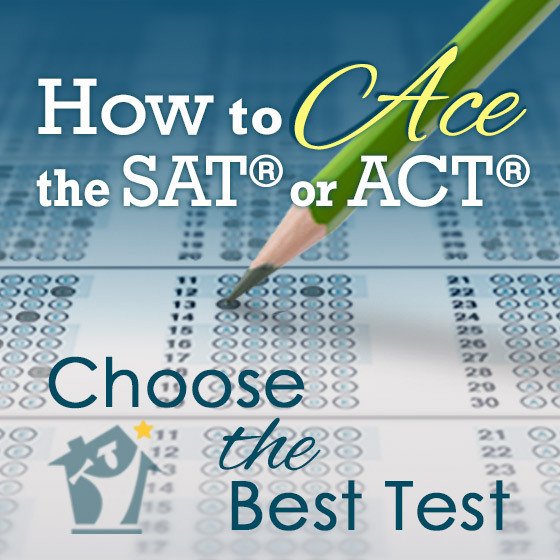 Taking a sample ACT and SAT is the single best way to decide which test is naturally best for your child. While the sample test does take 3 to 4 hours (and it’s a real pain, I know!) it can mean thousands of dollars in scholarship money, so it’s worth it. Plan a day off school, and schedule a reward after the child has completed the timed test at home. Going to a movie, buying ice cream, or baking cookies can make this long practice test more palatable. I recommend that you include the optional essay for both sample tests. Correct each test to determine what your child’s score might be. Then compare the SAT score to the ACT score based on your child’s percentile using the score comparison chart. The test with the higher percentile is the best test for your child. Pro Tip: if your child scores best on one test, but your chosen college prefers the other test, then register your child for both and provide both scores to the college. Once you have determined the best test for your child, the next step is to choose the right study materials. The best study materials mimic the materials used during the official test, so right now this means paper and pencil. Begin with a book filled with real test questions. These books tend to be the most reliable. Since study guides are updated each year, be sure to read the reviews before purchasing. You want your child to be able to fill out bubbles quickly and accurately. This comes from familiarity with the test questions, and practice filling out bubbles on an answer key when the questions are in a separate booklet. Set aside about 30 minutes per day, about 3 or 4 days a week. We did our core subjects in the morning, and SAT prep was first thing after lunch. During each prep session, give your child one section of the test. Tear out one complete test from the study guide you have chosen. Since each section is only about 30 minutes timed, on average, it shouldn’t mess up your schedule too much. Don’t spend time negotiating. Test preparation is much like changing a diaper – it goes faster if you don’t negotiate but simply go about your business in a matter-of-fact way. You want your child to be able to write a timed, hand-written essay quickly and in a well-organized way, but without panicking. Weekly practice writing a timed essay can give them the preparation they need. Set aside about one hour, one day a week, for your child to write a timed essay in place of a regular English assignment. Collect essay prompts from the study guide. Choose one writing prompt. Read the prompt first. Set the timer for 50 minutes. Have your child quickly brainstorm and outline an essay in one or two minutes, and then write an essay by hand. Correct the essay in the evening. This provides a short and sweet explanation that is best for children who are already reasonably good writers and they only need to know how to write quickly. This is a lengthy and meaty curriculum that gives thorough instruction on all details of essay writing in many different lengths. This might be best as a curriculum choice for the school year. This book provides easier writing prompts for beginners. It also gives a visual example of what a good essay looks like that can give you a quick and easy way to judge your student’s writing quality. This book can sometimes be found at your local library or school district. Not to state the obvious, but the time your child spends studying for the English sections on the SAT or ACT is time spent studying English. Your child can work less and you can reward them for being cooperative with test preparation. You can replace your regularly scheduled English lessons with test preparation. Instead of using vocabulary lessons, spelling, or editing workbooks, you can rely on SAT or ACT study guides to provide these lessons. Your English class might also include an “Essay Writing” unit study, along with your regularly scheduled reading selections. The best test preparation involves real test questions from the official test. It also requires the student’s active participation, and can’t be learned through passively listening or watching any class or video. For this reason, I suggest you start the process with an inexpensive study guide, a paperback book, and a pencil. If your child is engaged in and cooperative for the study process, it’s probably all you need. Some kids can’t or won’t do well studying on their own at home. In some situations, a formal test preparation class makes sense. While this won’t work without the student being willing to do their part, sometimes the investment in a class can motivate them to become more engaged. Or they simply take direction better from another adult. You can find classes in your neighborhood and online classes through homeschool organizations. It’s important to include real test questions and paper and pencil bubble answer keys, but you don’t have to limit your study to this. Khan Academy has partnered with the College Board, creator of the SAT test, to provide high-quality test preparation available for free online. You can also use flash cards for quick study in the car, when paper and pencil isn’t an option. You can also use SAT or ACT smart phone apps, for quick practice when you are driving your children to their activities. Don't skip the topics your child does best on. (Perhaps your child does great on the English sections, for example.) Your child’s best sections need to have the highest possible scores, to compensate for the average scores in their “not best” sections of the test. This way, they can achieve an even higher score. Pro Tip: Don’t use the class title "SAT Prep" on your child’s transcript because it's like saying, "My child studied for the test and this is still the best score they could get." Instead, if you are creating a separate class for test prep, consider calling it "Study Skills" or "College Study Skills" because this is a more general name that's not test-specific, and which implies they are ready for college level work. No amount of studying, and no investment in professionals, can compensate for a lack of understanding in a subject area, such as the math section - your child can't raise their score by much unless they understand algebra. At the same time, success with the test relies on two skills. First, your child has to be a sprinter - fast on each section of the test. Second, your child has to be able to sit and concentrate for a marathon test. 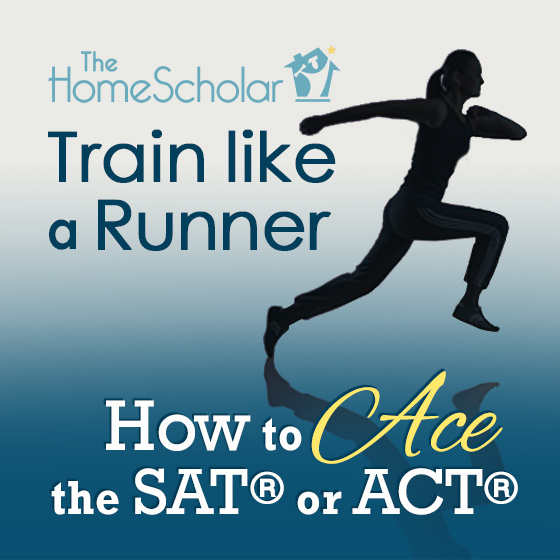 Train your child for the test like a runner. Prepare your child for the sprint as they get faster and faster in each section. And prepare your child for the marathon as they learn to complete a full length test without excess fatigue. Remember to choose the best test, and find a book with real test questions that have been used before. 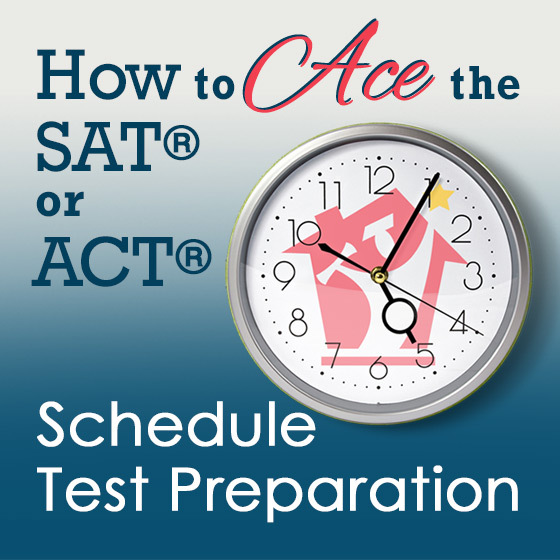 Before signing up your child to take the SAT or ACT this spring, prep for about 2 to 3 months for that specific test, because they are so different. Familiarity with the specific test matters. My children became familiar with test questions written by the authors of the SAT test. When they took the test “for real,” one of my sons can home and said, “I think I cheated. I’m pretty sure some of those exact questions were in my study guide.” Whether or not these questions were exactly the same, they were certainly close enough that my children recognized familiar test questions. Give your child one timed section of the test, about 3 or 4 days a week. Remember, this work will replace other grade-level English workbooks. Assign your child a timed essay, using real SAT or ACT essay prompts. Remember, this work will replace your English writing assignment for the day. Taking full, timed practice tests using real test questions that have been used in the past is an essential ingredient for success on the ACT or SAT. Sitting still and taking a full-length test is not an easy job, but it does require some practice. Taking a half-day test requires stamina. To train for this marathon aspect of the test, I suggest you give your student a full length, timed practice test every few months. Reward every full length, timed test with a special date for ice cream, brownies, or a movie. Reward their marathon completion by limiting other schoolwork that day. Don’t make their day longer by adding this challenge. Instead, use their test preparation as “school” and replace other school work with these hours of effort. Mimic real test conditions as best you can. Once a year, have your child take an official test. Register them for the PSAT in 10th or 11th grade, so your child becomes familiar with the public school testing environment. You can also find SAT or ACT seminars in your area, sometimes through the library, which can offer some real-world, timed practice in a strange environment in a room full of people they don’t know. Pro Tip: Your goal is to assign one timed section, 3 to 4 times per week, one timed essay once a week, one full-length, timed test every two months, and one test per year in a real test environment. In a perfect world, every child is compliant, studies for college admission tests with a willing and eager attitude, and achieves an above average score. But in the real world, sometimes the test is very soon, and your sweet child has potentially or accidentally forgotten to study because of a good reason or no reason at all. When this happens, what can you do? When the test is coming up soon, prepare for the test using non-academic methods. 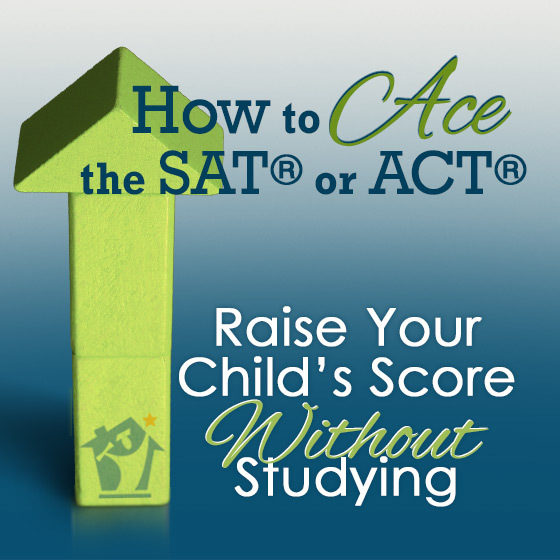 It is possible for your child to increase the SAT or ACT score without getting smarter. To do this, focus on the soft skills of test preparation, rather than academic-based answers to the questions. Here’s what to do if the SAT or ACT is days or weeks away. 1. Check the Test Location - every test location is completely different, and it can help to reduce stress if your child knows where the test will be. 2. Become Familiar with the Test - give your child at least one full length, timed test at home, for practice, and then one section of a test each day for familiarity. 3. Adjust Sleep Cycles - make sure your child starts to get to bed earlier and gets up early, so they arrive on test day well rested and ready. 4. Review your Homeschool Transcript Together - so the pre-test questions don't freak out your teen and make them feel as if they have failed before they begin. 5. Find Your State Homeschool Code - so your child doesn't stress out about anything unrelated to their test score. Find homeschool codes here. 6. Serve a Breakfast with Protein - good nutrition on test day will see your child through this stressful event. 7. Provide Water - research shows hydration improves brain function, so have your teen drink water in the morning and bring a water bottle to the test. 8. Bring a Healthy Snack - so when your child's energy fades, they have a healthy treat to re-energize before the next test section begins. 9. No Candy During Tests - the sugar high and crashing low are horrible for test scores, so no sugar of any kind during tests. 10. Bring 4 Sharpened Pencils - no matter how many pencils your child breaks, their test score won't be affected. 11. Bring a Familiar Calculator - be sure to bring a calculator, the one they use every day and feel comfortable with, not the new one you just bought. 12. Identify Pick-up Location - not even one brain cell should be worrying about how they will get home, all brain cells should be available for the test. 14. Pick an Answer - have your child choose one letter of the alphabet (A, B, C, or D) to always use when they don’t have a clue and shouldn't waste time on a question. There is no formula or calculation for what makes a good score on these tests. A good score is the best score your child can get. Colleges have different policies on how they award scholarships. A perfect score may earn a full ride at one college, but not earn any scholarships at another college. In general, as test scores go up, so does your child’s chance of earning a scholarship award. Think of it this way - your child's chances of earning scholarships go up as their scores go up. A good SAT score is the best score your child can earn. To guesstimate how your child is doing, I can suggest a scale based on the general population of the U.S. It doesn't fit every family, and it may not fit your child, but it can help you begin to think about test scores and what they might mean. The SAT is scored 200 to 800 per section, or 400 to 1600 for the whole test. 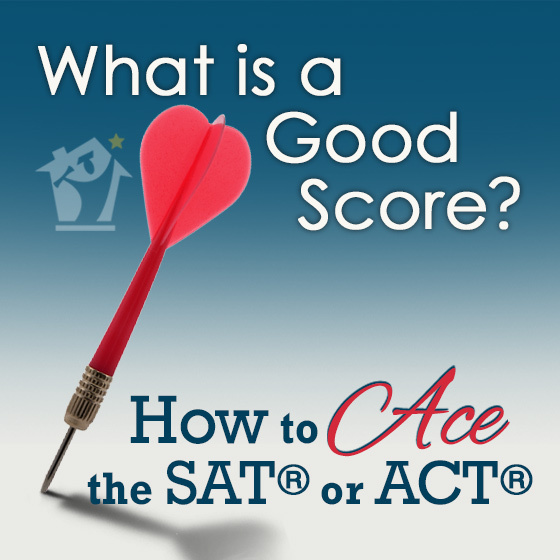 Similarly, for the ACT, the definition of a "good score" always depends on the college your child is applying to, but I can give you some generalizations that will help you think it through. Each college is different, and each college accepts different average ACT scores. So look at the details for each college you are considering. Compare your child’s ACT scores to the college’s average ACT scores. This will tell you what a good score is at that particular college. Or put another way, for either test, scores affect your chance of scholarships. At any college, test scores are merely one of the things they consider when they make their decision. They will be looking at your child’s transcript, GPA, course descriptions, activities, reading list, essays, and letters of recommendation. All your child has to do is their own personal best on the test - they don't have to get a perfect score, simply their own best score. Familiarity with the test will increase the test score even if they don't get smarter, because your child will get more comfortable with the format and how the questions are asked. Anything you can do to keep teens alert and rested will increase the test score without studying because it will allow their brain to fire on all cylinders. Nutrition and hydration improve brain function. Reducing stress levels will allow them to be as relaxed as possible in an already stressful situation. If your child does the best they can do on the test, they could still receive automatic financial aid worth thousands of dollars even if they don’t win the National Merit Scholarship or earn a full tuition award. They don’t have to be better than anyone else. They merely have to score high enough to get to the next level of scholarships based on their test score. And then it will all be worth it. Copyright © 2017 The HomeScholar LLC, www.HomeHighSchoolHelp.com. Text may be reprinted without permission if used in full, except for use in a book or other publication for rent or for sale. 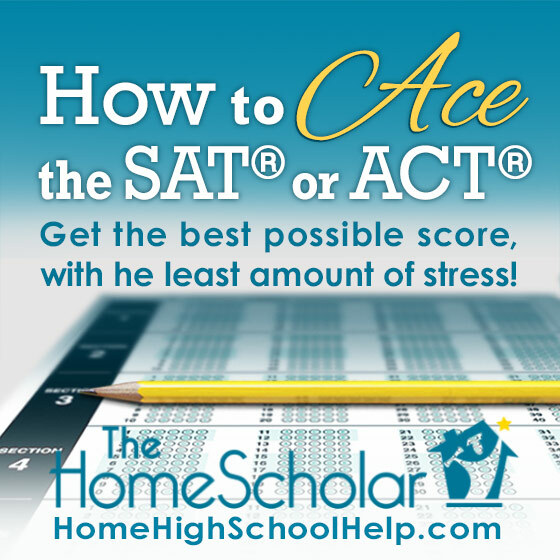 Reprint must include this copyright, bio (below), and the original URL link (https://homehighschoolhelp.com/how-to-ace-the-sat-or-act). Understanding the common high school tests, such as the SAT, ACT, AP, and CLEP can lead to huge college savings. Colleges reward high test scores with great scholarships. That’s why it’s important to learn all you can now to help your child do their best on any tests they take. 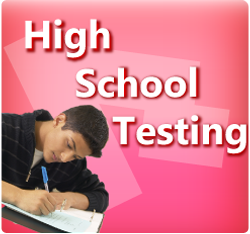 “High School Testing,” compares all the major high school tests available to homeschoolers, and outlines the strategies and study tips your child can use to excel at college admission and scholarships. Whether or not you’re a fan of standardized testing, you’ll learn their value and which ones are worth the time and effort. Understanding the common high school tests can save you real money right now - saving thousands of dollars on college. 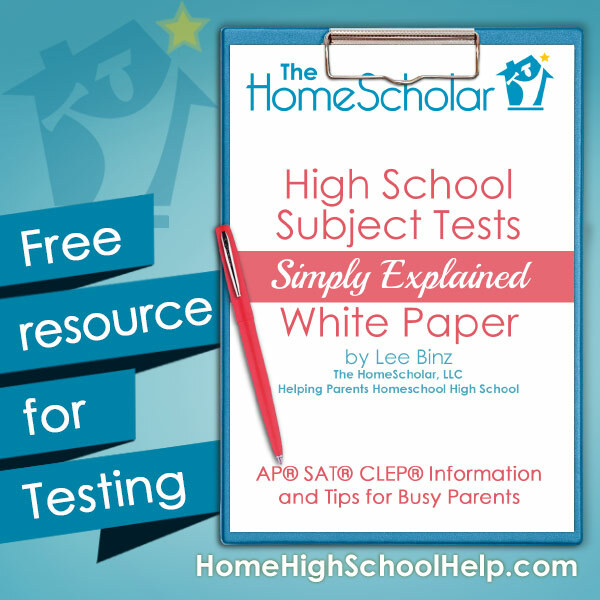 Lee compares major high school tests, discusses general strategies and study tips, and shares how her sons homeschooled one year of college using CLEP exams. For more outside documentation, create an accurate and professional official transcript, and thorough course descriptions. College admissions is extremely competitive! Comprehensive records will set your student apart. The Comprehensive Record Solution is geared for parents who know they need to do more than “just a transcript.” It will enable you to create the transcript, but the focus is directed at much more, such as course descriptions, reading list, activities and award list, and work samples---all the elements that go into a “comprehensive” record.